If you are unsatisfied with the look of your smile and have been researching cosmetic dentistry techniques, you may have come across the term: smile makeover. At his cosmetic dentistry office in Orland Park, Kenneth Coffey, DDS, takes pride in offering smile makeover procedures to patients hoping to boost their appearance and confidence through a beautiful smile. But what exactly does that term mean, and what kind of procedures are involved in a smile makeover? You may be surprised to learn that there is no specific technique that constitutes a smile makeover - instead, a smile makeover can be any number of combinations of cosmetic dentistry techniques used to drastically transform your smile. Your cosmetic dentist will work with you to identify the changes you want to make, and put together a custom treatment plan to help you achieve the bright smile you deserve. What Are the Most Popular Smile Makeover Treatments? Porcelain Crowns: Whether you are using it to top a dental implant or to reinforce a natural tooth weakened by injury or a root canal, you want a crown that looks beautiful and natural. Porcelain crowns are designed to look and feel entirely natural, and can be custom molded to fit in perfectly with the rest of your teeth, making them a desirable alternative to traditional metal alloy crowns. Porcelain Veneers: Porcelain veneers are thin porcelain shells that are permanently affixed over the front of visible teeth, creating a bright and uniform look instantaneously. 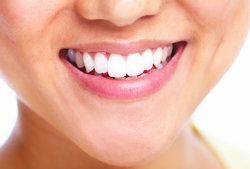 Porcelain veneers are perhaps the most popular smile makeover technique, due to their ability to drastically change a patient’s smile within only a couple of dentist visits. While porcelain veneers cannot correct all dental issues, they can mask a wide variety of cosmetic flaws including chips, cracks, gaps, and minor orthodontic issues such as crooked or crowded teeth. Dental Bonding: In the case of dental bonding, natural-looking tooth colored resin is custom sculpted and bonded to the surface the tooth to correct cosmetic flaws such as cracked or chipped teeth, to fill in gaps between unevenly spaced teeth, or to make short, misshapen, or otherwise unevenly shaped teeth appear more consistent. Compared to porcelain veneers, the affordability and minor amount of dental work required can make dental bonding an appealing option for dental makeover candidates. Teeth Whitening Treatments: A cosmetic dentist may utilize bleaching agents on their own or with the help of ultraviolet light acceleration to correct teeth that are yellowed or otherwise stained. In the case of a smile makeover, teeth whitening may be employed on its own or in conjunction with other treatments. Dental Implants: If you are suffering from broken, severely decayed, or missing teeth, dental implants are a strong, durable, and permanent option for tooth replacement. Your dentist will surgically implant titanium posts directly into your jawbone - once these posts have healed and integrated properly into your jaw, your dentist can then attach a porcelain dental crown or set of dentures. The result is teeth that look and feel as strong and natural as the set you were born with. Don’t be self-conscious about cosmetic flaws in your smile - do something about them. Contact the cosmetic dentistry office of Dr. Kenneth W. Coffey to schedule an appointment and learn more about your smile makeover options today.